I tend to be sort of a nontraditional Easter menu planner – throwing things onto the table like chicken instead of ham, pasta instead of potatoes. But my husband…well, he is traditional in every sense of the word when it comes to the Easter meal. Which means, since I decide 99.9% of the time what we eat for dinner, that I heave a big sigh and then give in to him every year and we have ham. There is nothing wrong with ham at all. I just like to buck the system and eat it for the 4th of July instead of for Easter. If you are looking for a great ham recipe this year, I have two up my sleeve that are fantastic. This Slow Cooker Maple Brown Sugar Ham is easier than easy and very delicious (take care not to cook it too long!). The other is a classic ham recipe that I wanted to share if you are more into the oven-roasting method. This ham utilizes your talents in whipping together your own glaze – and it is worth it. Be gone, sugary, grainy pre-packaged glaze mixes! This glaze is maple-syrup-and-dark-brown-sugar-sweet but balanced perfectly with whole-grain mustard, cinnamon and apple jelly. It sounds bizarre but it comes together perfectly. Ham is a pretty low maintenance meat, and this recipe is no exception. The ham roasts in an oven bag for a couple of hours, is smothered in glaze and then hotly baked to caramelize the delicious flavor. Succulent, tender and delicious. Remove ham from the original packaging and throw away the glaze packet and the plastic disk that covers the bone. Place the ham in the large oven bag and tie closed. Cut four slits (about 2 inches each) in the top of the bag. Transfer the bagged ham to a roasting pan and let it sit at room temperature for about 1 1/2 hours. Heat the oven to 300 degrees and bake the ham for 1 1/2 to 2 1/2 hours (until the internal temperature of the ham is about 110 degrees). About an hour into baking, start making the glaze by combining the jelly, 1/2 cup brown sugar, maple syrup, whole-grain mustard, cinnamon and nutmeg in a medium saucepan. Bring the mixture to a boil and reduce the heat to low, simmering, until the mixture is very thick and syrupy, about 45 minutes. Stir often while it simmers (it should reduce to about 1/3 cup). Off the heat, whisk in the butter. Combine the remaining brown sugar and dry mustard together in a small bowl. Remove the ham from the oven and let it sit for 5 minutes. While it rests, increase the oven temperature to 400 degrees. Carefully cut open the oven bag and let it fall to the bottom of the ham so the entire ham is exposed. Using a pastry brush, paint the glaze onto the top and sides of the ham. Carefully press the sugar mixture onto the outside of the ham with your hands. Return the ham to the oven and bake until it is dark brown and caramelized, 14-16 minutes. Let the ham sit for 15 minutes before carving. This recipe calls for a large oven bag. Looking forward to trying this for Easter. What is whole grain mustard. I can’t seem to find it at the store? I’m also making your garlic mashed potatoes to go with it. Can’t wait to try both. Hi Trish, it’s mustard that has visible brown flecks of mustard seeds in it. Grey Poupon is a widely available brand. 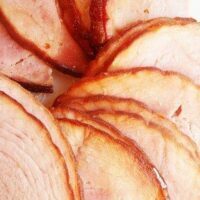 This is a great recipe for baked ham and so easy to do! The glaze is wonderful and my whole family loved it! Just wanted to comment to say we made this ham for my son’s “Angry Birds” birthday party (Roasted PIG!! get it?). We had 9 adults and 6 kids. I had a 14lb ham and it was completely to-the-bone by the end of the party (plus we had many side-dishes). Everyone was dying to know the recipe! We served with sweet bread for sandwiches. I’m re-creating it for Thanksgiving. Love to hear that, Amy! This may be a silly question but I have never cooked a ham before. The one I purchased is pre-cooked, will this recipe work for that? Thanks! Hi Mel– I see your comment above that you’ve never made this ham without the bag, but I have a few questions anyway. I went to the store to get all the ingredients and they didn’t have any oven bags! So, now I’m thinking I have two options. My roasting pan has a lid with a vent you can open and close. Since the instructions ask for vents to be cut into the oven bag, do you think using the lid with the vents open would work? The second option I could think of would be to cover the roasting pan as tightly as I can with foil, and cut a few vents in that. Which do you think would be second best to an oven bag, since I can’t find one? Thanks for your advice! Megan – given those two options, I’d probably choose the tin foil one with slits cut in it. The idea is to keep in as much moisture as possible. Good luck! Hi Mel!! Can this Ham be cooked with out the bag? If so, how? Love EASTER time! Hey Deb – I’ve never made it that way – the bag is apparently the key to success and I have to confess, it really is delicious (the bag helps keep in the moisture). The butter has been inadvertently ommitted in the directions. Does it go in the glaze? Also, what brand of whole-grain mustard do you use? Hi Kim – thanks for the heads up. I just edited the recipe…the butter is whisked into the spice mixture at the end. lila jean – I’ve never made the glaze before but it’s probably worth a try. And yes, the chantilly potatoes can be made ahead of time. Well hello there friend. I am reporting the major success that was this ham! We had it alongside the turkey for Thanksgiving and it was everything I hoped it would be. I have always been kind of a ham-snob–thinking that nothing would ever beat a Honeybaked Ham, so why bother?! But I didn’t want to shell out all the cash for a ham when I was already feeding 15 people, so I turned to you and you didn’t let me down! This ham was dare I say BETTER than a Honeybaked. The glaze was the perfect balance of sweet, spicy and tangy. And I just ate the most fabulous ham sandwich in history. It’s always so validating to find a recipe that you go, “Ok, I don’t have to look anymore–this is the perfect one”—and this recipe is exactly that for me! Reyna – SO glad this ham exceeded your expectations. Thanks for letting me know! Cammee – well, to be honest, I like them both for different reasons. 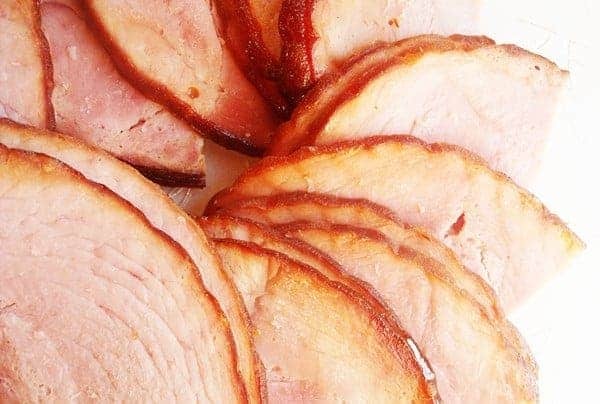 The slow cooker ham produces almost a deeper, smokier ham, whereas this glaze ham is purely classic. more often than not, i’m shattered by the nastiness of those packaged glazes. the simple fact that yours makes use of apple jelly AND cinnamon is enough to convince that it’d be awesome. this is a keeper, melanie–thanks! So now you need to divulge: which ham recipe do you like better? Sure, I could make them both and find out myself, but I’ve become accustomed to letting you do all of the work for me and I reap the rewards! They both look fantastic.